Three-time major champion Padraig Harrington carded a five-under-par 67, a score matched by both Gary Murphy and Peter Lawrie. TODAY’S FIRST ROUND of the European Tour’s Portugal Masters amounted to nothing less than a full-on, day-long birdie fest. Comparatively short, well-manicured and denied any protection by the elements, the Oceanico Victoria Golf Course at Vilamoura prevented few obstacles to scoring. The vast majority of the field– a full 82 players– succeeded in breaking par, with the round of James Kingston proving the pick of the bunch. The South African carded nine birdies and one bogey en route to an opening 64, enough for a one-shot lead over a group of five players, including Northern Ireland’s Gareth Maybin and the resurgent Thomas Bjorn, who, somewhat remarkably, competes this week in the hope of securing his fourth title of the season. 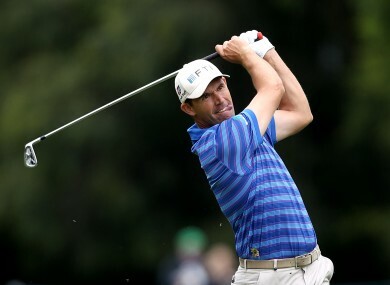 Padraig Harrington, whose work with new coach Pete Cowen appears to be paying dividends, lies three shots off the lead after a round of 67, a score matched by world number six Martin Kaymer, Dublin’s Peter Lawrie and Kilkenny native Gary Murphy. Both Shane Lowry and Damian McGrane sit two shots further back on three-under-par. By contrast, 2002 Ryder Cup hero Paul McGinley struggled for form and had to settle for a disappointing 74. Email “Irish open strongly in Portugal”. Feedback on “Irish open strongly in Portugal”.